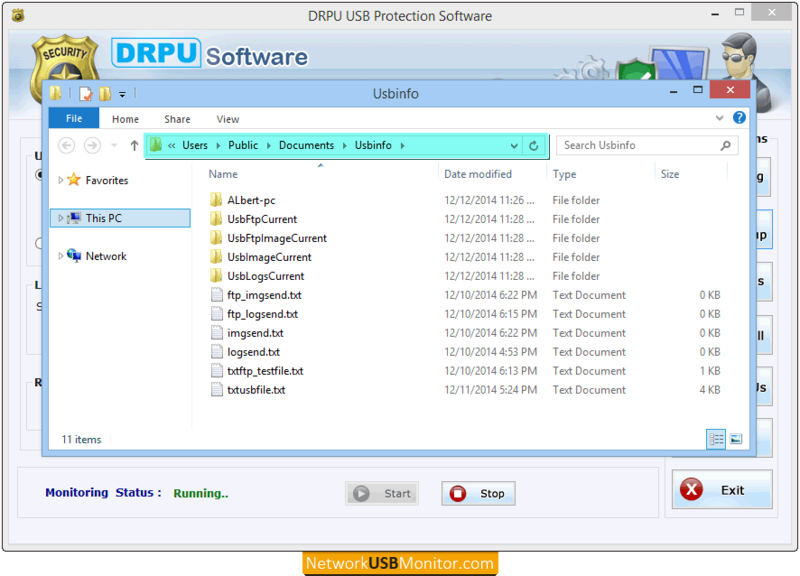 Software provides various settings to protect your USB data and send saved log via email, upload created text log by FTP, capture images, import/export settings, view log and view backup as per user need. 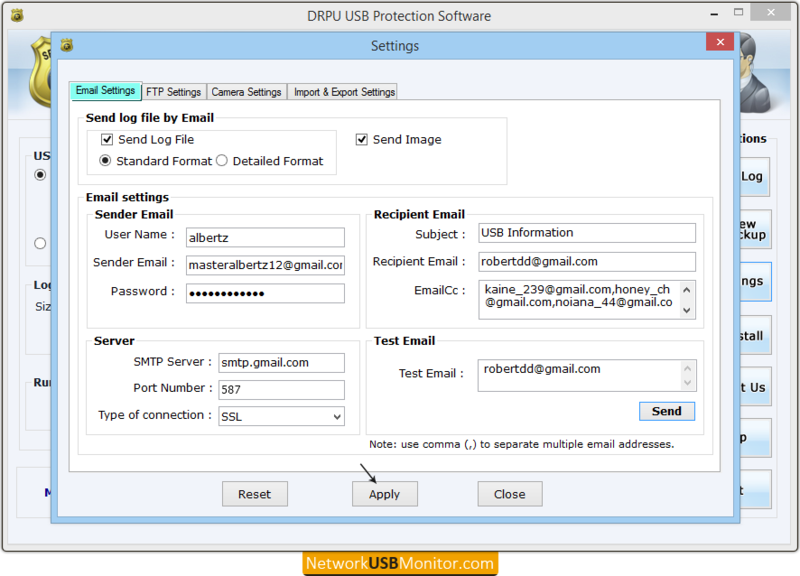 Email settings option is used to send text log and captured image via email. Go to “Settings” function button and click on “Email Settings” tab, the above window will be displayed. 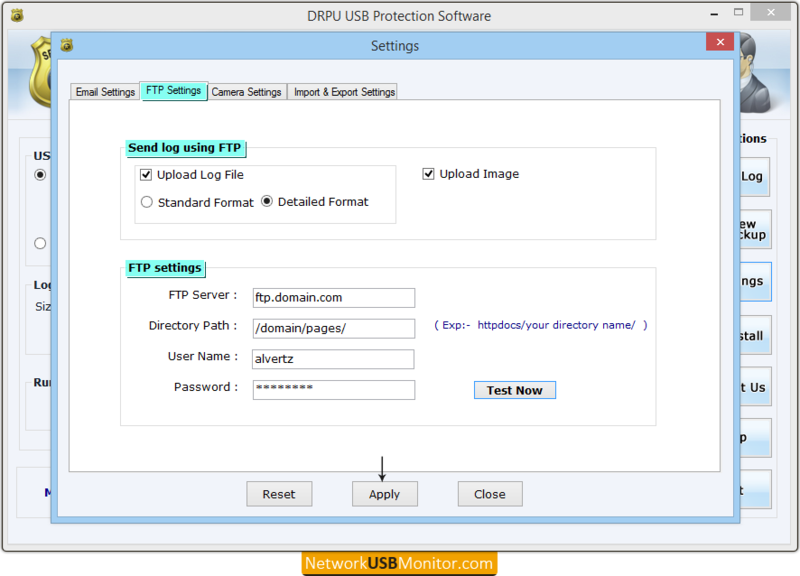 This option allows you to upload text log file and captured photos on FTP server by FTP. FTP Settings will work properly only if FTP server facility is available. Go to "FTP settings“ tab, the above screen will be appeared. 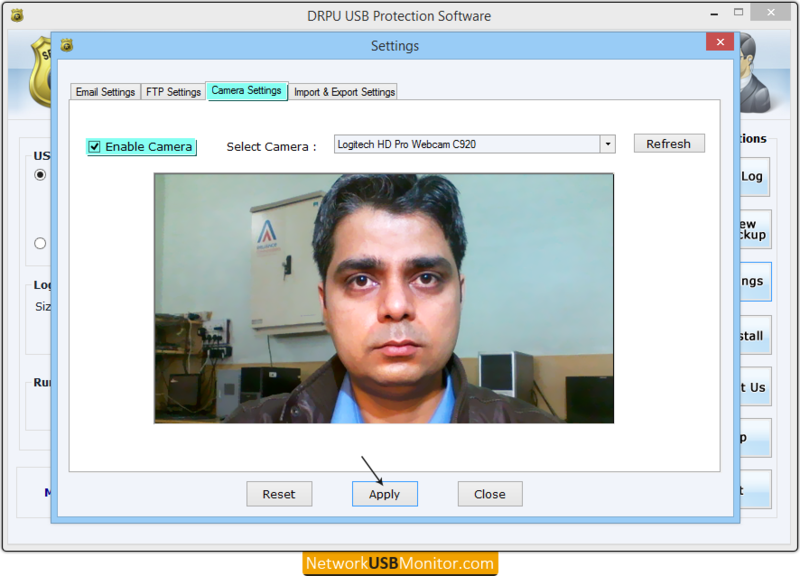 DRPU USB data theft protection tool is capable to capture photos of unauthorized user if camera is enabling on your computer. Just go to “Camera settings” tab, the above window will be shown. Press “Settings” function button and click on “Import & Export Settings” tab, the above screen will be displayed. 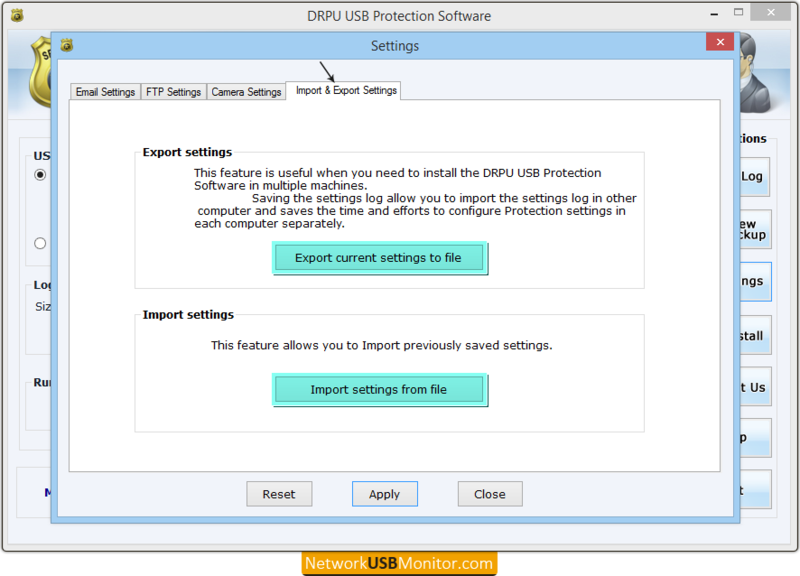 This window allows you to Export current settings to file and Import settings from file. This feature is useful when you need to install software in multiple computers. This window display all connected USB media log list, using this window, you can view log in HTML or TEXT file format using “View HTML” or “View TEXT” button respectively. Click on “View Backup” function button, the above window will be displayed. 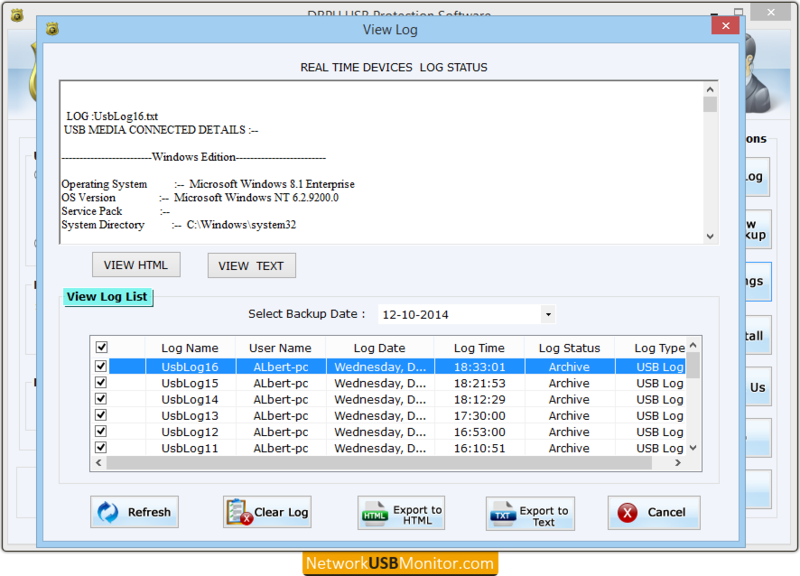 This window consists backup of all recorded data created according to system with data and time. Now double click on backup folder or .txt file, to view related log information.